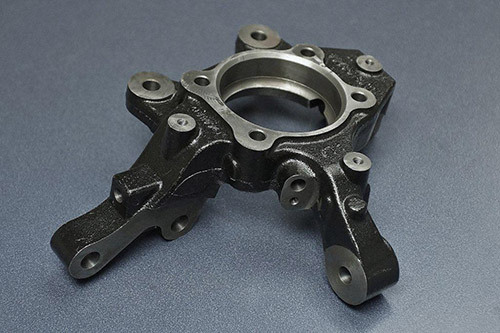 We manufacture a variety of automotive suspension and power train components, which requires capabilities that go far beyond most machine shops. 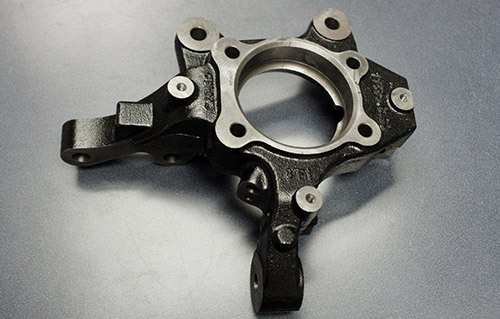 We manufactured this critical automotive component for an auto manufacturer in Michigan. 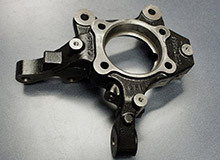 This part was designed to be used as a steering knuckle. 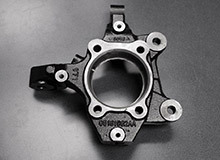 This component is not only responsible for a cars steering but it must also support the entire front end. Manufactured from high strength D65-45-12 ductile iron, it featured dimensions of 10.5" in length, 9.5" in width, 4" in height, and meet tolerances of ±0.0006". 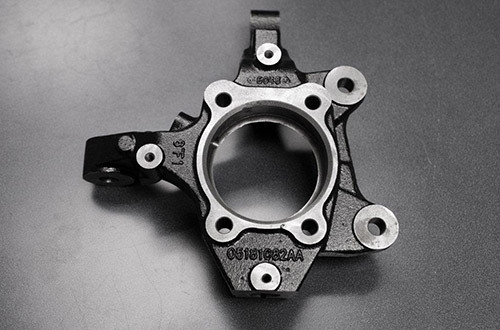 The milling processes required to manufacture this component include drilling, boring, reaming of tapered holes, as well as straddle and slot milling. After milling, the parts had a groove machined, followed by tapping, and tapered hole reaming. 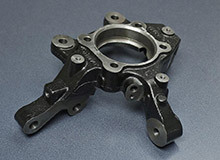 The finished parts were deburred and featured an e-coat and machined finish. We currently manufacture 3,200 of these components to this customer per year. To learn more about this project sees the table below or contacts us directly. Product Description This Knuckle is used on a Car's Suspension Assembly. Overall Part Dimensions Length: 10.5"
In process testing/inspection performed Inspect and Record "SC's"